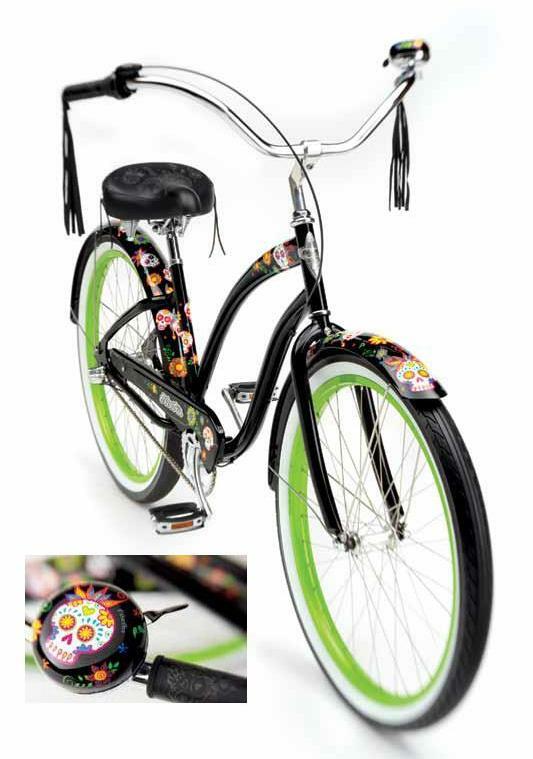 We’re thrilled every year to see the latest new designs from the Electra Bicycle Company, especially in the line of their Ladies’ Fashion Cruisers. First of all, the bikes are incredibly comfortable and easy to ride. Each constructed from the same frame geometry, with different paint design’s, they feature Electra’s Flat foot technology; a slighter forward pedaling position that allows for a lower centre of gravity, better control, and more room in the cockpit. 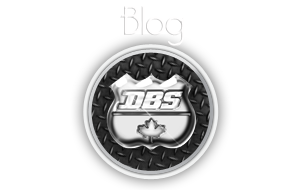 Their wide comfy sprung seats and wide cruiser bars allow you to sit fully upright in a position that leaves you riding relaxed and carefree. For 2012 Electra has brought out 4 new ladies models that are right off the fashion runways. Mexican Folk Art Sugar Skulls from El Dia de los Muertos, the Day of the Dead festival inspired this cruiser. Known for their color and humor, the Mexican sugar skulls embody a light-hearted view of death, and celebrate life as it continues in another form. Sugar Skulls Art is currently popular fashion trend in both tattoo and clothing. The Electra Sugar Skulls 3i celebrates this concept right along-side with a multitude of fun and colorful sugar skills painted throughout the frame and accessories. The bike is edgy and bold, and expresses a completely different personality than the typical “flowery” cruiser. From the Southwest American Navajo fashion trend, inspired by the hand-woven textiles of the Navajo that have been sought after by art collectors for over 150 years. With bold contrasting colors and geometric patterns, the art form has been passed down through generations. In the Navajo culture, The art of weaving is deeply felt expression of beauty, harmony, and balance. 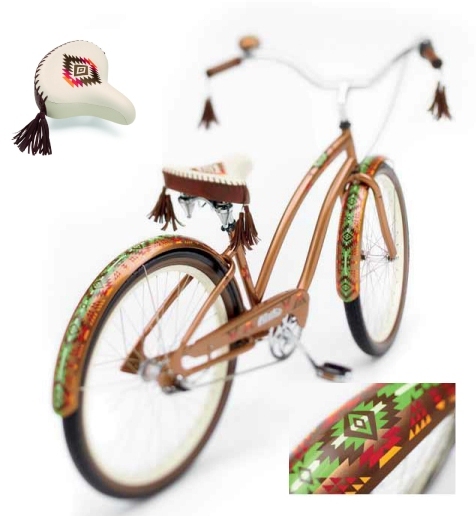 The Electra Navajo 3i embodies this philosophy with its rich colours, geometric designs and embroidered and embossed saddle adorned with tassels. The bike transitions from day to night, with the mysterious and wise old Night Owl watching in the dark night on the front fender. The paint fades to blue as it transitions from night to day and ends with the Owl sleeping, eyes closed, on the rear fender. The Electra Night Owl is classy, complex and inspiring. Mariposa means Butterfuly in Spanish. 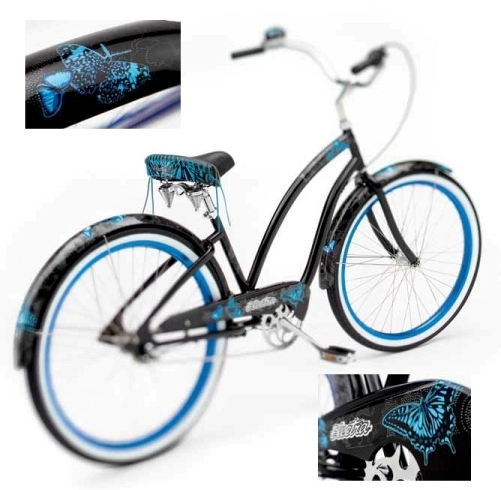 The bikes is adorned with beautiful blue butterflies on a rich black frame. The Electra Mariposa embodies freedom and artistry. 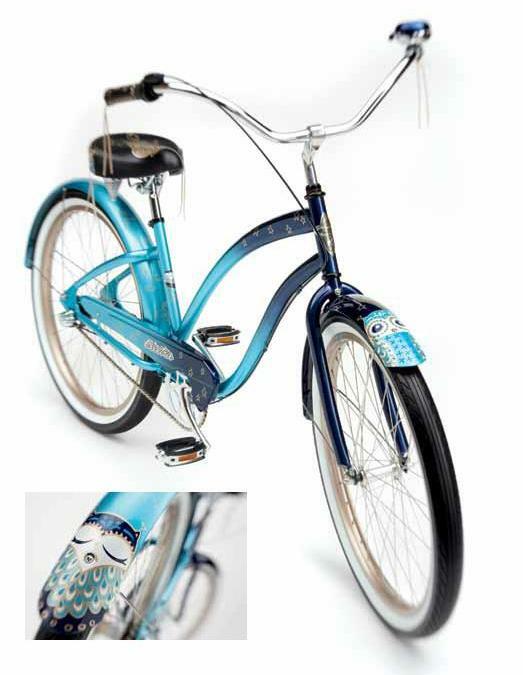 Come in to our Vancouver Bike Store, and test ride an Electra Fashion cruiser today!